First of all, thank you to all of you who made suggestions for alternate forms of treatment. Since her diagnosis, we have spoken to nearly 70 of the world’s top neuro-oncologists, neurosurgeons and many other experts in the field of pontine tumors. Without your help, we would never have been able to find all of these people and get the level of access we had. 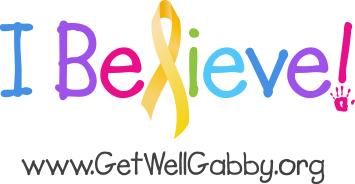 After speaking with several experts in the field, and reviewing the options with the team at CHOP and several other medical professionals, Gabby’s parents made the decision last night that following the CHOP-recommended course of treatment is the best course of action right now. All of the other options on the table are too risky, too toxic, or Gabby would have to wait for a slot in the program to open. None of these seem like a prudent option with her current condition. So tomorrow morning she begins a combination of radiation treatments and chemotherapy to help shrink this tumor. She will be treated with radiation five days a week for the next six weeks. 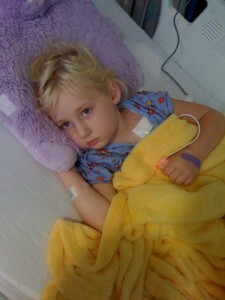 Today she had surgery to put in a port. This allows the doctors permanent access to her veins so they do not need to put in an IV each day before her treatment begins. For the moment, Gabby will stay at CHOP for a little longer until the treatment program is underway so she can be monitored more closely and continue with her physical therapy. Keep her in your thoughts and prayers as this treatment starts. The odds are against her. Gabby needs all the strength she can muster to beat this. I don’t know you, but I know your dad from work at Citibank. In looking at your website, one thing stands out. You have so much love around you!! My thoughts and prayers are with you and your family. I look forward to meeting you in-person some day. Be well, smile often, and know that brighter days are ahead.